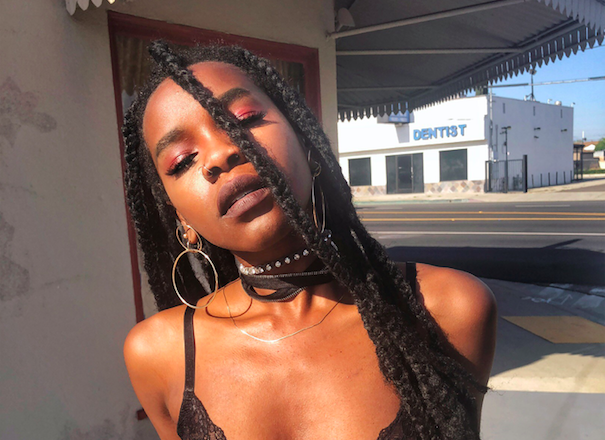 I recently caught up with a female artist based out of Los Angeles named Cee. Something about Cee made me think that she has a lot of potential. She doesn’t have a whole lot of music out right now but she is currently working on a new mixtape that she hopes to surprise people with. She has the look, she has some nice little freestyles on her social media pages and her first single dropped called Slide Show. There are some female artists making a lot of noise right now and all of them are from NYC. I wanted to give an underdog from Los Angeles a shot so check out what she has to say. MusicalFury – Hi Cee, how are you today? Cee – I am doing good. MusicalFury – I initially heard about you through some freestyles you did on social media that caught my attention. How long have you been interested in the music business? Cee – Well, I actually was born in Dallas TX and then moved to Los Angeles in pursuit of the entertainment business because my parents witnessed me singing and dancing around the house. They realized that this was something that I was meant to do since I was about 5. MusicalFury – Not only do you rap but you also sing as well, right? Cee – I do, yes. I have recorded songs that are mixing both hip hop and singing. I am also putting together a mixtape that will switch between these and I am trying to make sure the sound is right. MusicalFury – Can you tell me a bit about yourself and maybe some things that really influenced you to start making music? Cee – My dad is a musician, he kind of picked up on my talent from a very young age. My parents put me through music classes and helped me to hone my skills. From there poetry and music became like one to me, so if I feel wound up it is something that I go to express myself. I feel it is something that I was made to do. MusicalFury – Who inspired you most to make music? Cee – I grew up listening to 2Pac. He was one of the first rappers that I could memorize the raps to. I also loved the heartbroken type R&B music like Etta James. Those two worlds were great for me like the hip hop and R&B. There are so many artists within that era that are so iconic to me. MusicalFury – What is your goal or plan with music, are you looking to make it your main source of income or is it more of a hobby that you eventually hope to make a name for yourself? Cee – I am hoping to make it my way of life. I would like to be able to support myself with music. When I work my day job I am always sneaking to make music. I would rather have the pressure of making music as a job rather than it just be a hobby. MusicalFury – If you had to name 5 artists, dead or alive, who you think have/had the most talent and made the biggest impact on the world, who would they be? Cee – I would have to say The Carters, Lil Wayne because of my personal influence, 2Pac because of his entire influence on the hip hop game, Lil Kim because she inspired a lot of female MCs and her music is very relevant, and Aretha Franklin personally. Yes, I had to put a singer in there and I really love her music. MusicalFury – Are there other artists that you are hoping to make connections with in the near future and collaborate with? Cee – Definitely, I would love to work with Kendrick Lamar. I feel like he covers so many topics and can combine a lot of different things. He has a very distinctive style and I would love to obtain that sort of various vibe that he has. The Carters are also so influential in a crazy way. I would want to work with a lot of the big wigs in the industry as well because I am sure they can pass down a lot of jewels to me about the music business. MusicalFury – I am a very curious person and like to understand how other people think regarding spirituality and religion. Are you willing to give me a brief description of your thoughts on religion and God? Cee – Sure, to me God has been very important my entire life. I grew up as Baptist Christian and very religious, but once I witnessed a fatal elevator accident it had a big impact on me. My beliefs went more from religion to spirituality in a sense. I believe that God is the most powerful thing and spirituality is really going to be relevant as I move along in the music business because it almost feels like a responsibility of mine to articulate. MusicalFury – That is really great, I am glad you will try to incorporate some of your spirituality and religious beliefs into your work. As a closing statement, do you have any last remarks or music that you have been working on that you would like to promote? Cee – I am working on a new project right now that has a tentative name which is Cee Sims Playlist of Urban Sounds. It is going to be heavily hip hop influenced because it is a mixtape but there will also be some R&B as well. MusicalFury – That sounds really good, I look forward to hearing that when it comes out. Thank you very much for your time, I wish you much success with your endeavors. Cee – Thank you, you too.